Over 10 years experience up and down the mountains around the world, action and passion with the outdoors, hundreds of rocky, snowy and grassy peaks behind, you could guess the challenge goes up to the highest Earth's summit. Personal goal: to reach Mount Everest on the age of 30. (Knowing that no woman from my country and nation has climbed it so far, I had a double challenge and motivation). At the moment when I felt enough psycho –physical strength to survive the effort, I had a bigger issue to face, which is finding financial condition for supporting this kind of expedition. Until the last moment I was uncertain whether I will be able to join the expedition this year or not. It was not easy in the past year and a half to be your own PR, manager and an athlete at the same time. I believe this phase taught me many things, made me stronger and more resistant. But it also took a lot of my energy. Instead of training till the last moment I was struggling with the technical part of the project. I literally invested all I could from my personal side with the help of my extended family, which was far from enough. I never stopped believing, nor hoping. In Macedonia we have a saying: “Hope dies last”. And this is what happened to me. Huge respect and deep gratitude to my partner Ilija Ristovski with who I climbed most of the mountains in my life. We couldn’t afford going together, so once again he showed his solidarity and support letting me go up, using all sponsors we have raised together. Thanks to some people and organizations I managed to collect the necessary equipment and funds that will finally confirm my place on the Everest ‘13 trip. I am grateful to everybody who helped but especially: The federation of mountain sports of R.Macedonia, marketing agency Republika, AD ELEM, Agency of Youth and Sports, Burton Snowboards & Burton Girls, T-mobile, EVN, TINEX, Adjibadem Sistina, Or-Ka Sport, Farmahem, The Red Cross of city of Skopje …. Without all of you we couldn't have made it. The idea to climb Mount Everest was not only a personal challenge but also a message I needed to spread to all women with high ambitions in their lives. By climbing the world’s highest summit I wanted to show everyone who hesitates about reaching their goal that everything is possible with strong will, persistence and, of course, hard work. When I arrived to Katmandu, I had not much time to start approaching the mountain. I started alone since the group I was supposed to join had left few days earlier. I was walking by myself to the village and monastery of Thame on around 4000m altitude. Finally I met with the rest of the group. Our team is small, and all of us are highly experienced climbers. We are 7 people to climb and we had 2 trekkers who spent the three trekking weeks with us and then left after some days at the BC. Our leader Tim Mosedale is one of the first Brits to climb Mount Everest both from South – Nepali, and North- Tibetan side. He is a great leader and a climber. In Thame monastery we had puja, traditional Buddhist ritual for blessing. This was a memorable moment, where all generations of Lamas were playing different instruments and singing mantras for compassion. For better acclimatization we took a longer period for trekking before joining the rest of the crew on the Everest Base Camp. Renjo pass is where we cross over 5000m. We slept in lodges and tents on wisely chosen location for best way of acclimtizing. Entering Gokyo valley, we aimed to cross over the Cho la pass. The new snow stopped us, so following another trail we came to Kongma La where we camped for two nights. We climbed the peak Pokalde 5800m which was a solid technical training with steep ridge at the very end, with the need of using ropes. After three weeks of trekking, finally through the Kumbu valley we headed towards the Base Camp. Everest Base camp is an interesting place where many trekkers meet with the climbers. For someone this is the highest point to reach, and for some the challenge is about to begin. The Base Camp (BC) is the place where we are going to spend most of the time in the next month. There are alternative living conditions on BC, made for us by our logistic team. In the Mass tent we had a table with chairs where we all joined for food, or for technical meetings. In the solar tent we had all the charging stuff. The improvised kitchen build up from stones covered in a nice yellow plastic cover is one of my favourite places where I spent time learning Nepali while landing a hand to the kitchen crew. The expedition really starts now. We are well acclimatized since we spent few nights on altitude of 5550m, which is higher than BC. We had another puja, official one, in the BC. It was a wonderful experience. The local Lama is singing mantras while the Sherpa are assisting in the group ritual. Acclimatization continues up to 7500m. It took us about 10 days to go through the final phase of acclimatization. Touching camp 3 and back on BC. We only made 2 rotations through the ice fall since we were already well acclimatized. Back in BC we wait about 10 days for a weather window to climb the summit. Some people used a narrow window in between which caused many injuries and even deaths. On the BC at the moment there are 40 different teams who are waiting to go up. We need to play smart and avoid the crowd. Crowd on the trail is what really frightens me. At the moment we were five of us going together. Long days, with more than 1000m elevation with heavy backpacks. After camp 3 towards the south col, we start using oxygen. The O2 is really helpful but the bottle is a weight itself. It took us 5 days to reach the summit. 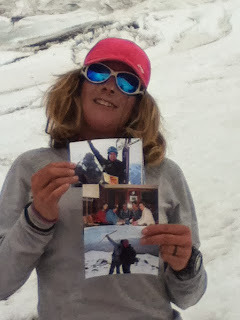 BC 5300m - C2 6400m, Rest at C2, C2 6400m - C3 7400m, C3 7400m - South Col 7950m, South Col 7950m – Summit 8848m – down to C2 6400m. At the very end there were 3 of us going towards the summit. Together with our Sherpa who were walking next to us only on this day, we were the only ones on the trail. We deliberately took off earlier to avoid any possible crowd. I was the third person on the summit that day. It was still dark, we went faster than expected, so we met the sunrise on the way down. It was a stunning view to see all the Himalaya around you. My feelings were mixed. 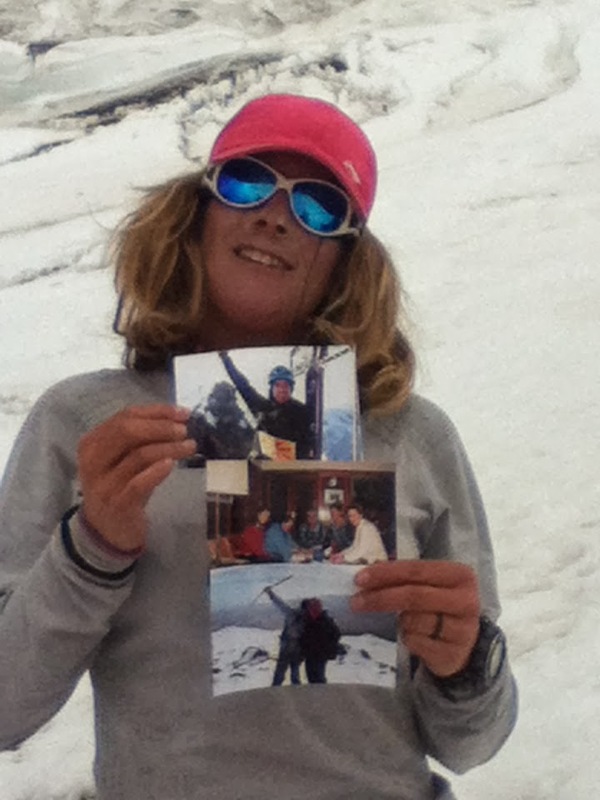 Happiness, tiredness, confusion … did I really just climbed the highest Earth’s point? While climbing I was also painting and drawing. I was drawing sketches keeping kind of a visualized diary all the way up. It is part of my artistic project "ActivArt". On the BC I used on of the sponsor flags and used it as a canvas. 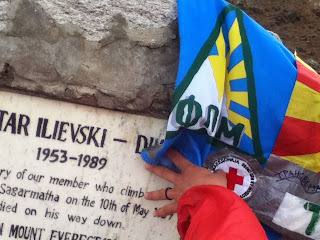 While on C2, 6400m on the T-mobile flag I decided to sign all the people who somehow helped me before and on this trip. That is how I made another piece of art with a huge meaning for me and hopefully for everyone who supported me. A very special moment for me was visiting the memorial monument of Dimitar Ilievski Murato, the first Macedonian person who summit Everest in 1989. The monument is located between other heroes who scarified their lives in the name of the glorious mountain. It was a great pleasure to be part of the team. Thank you Tim Mosedale for this unforgettable experience, my team mates: Adam, Jon, Steve, Stuard & Tom, the amazing logistic team: Henry, Kame and all my Sherpa friends. Bravo Ilina. Congratulation on your achievement , and good luck in your further challenges . Браво Илина, ти си наша МАКЕДОНСКА ГОРДОСТ !! !